Welcome to Amazon Australia, one of the largest online shopping websites. Amazon Australia offers a huge selection of books, electronics, computers, clothing, luggage, shoes, toys, DVDs, sporting goods, beauty and much more. Browse the enormous range at Amazon Australia via the 'Shop Now' button to earn Cashback on your purchases. • IMPORTANT: Items must only be added to your Amazon cart after clicking from Cashrewards. Ensure your Amazon cart is empty before clicking from Cashrewards, as items added prior to clicking will not earn Cashback. • You must return and click through from Cashrewards to Amazon every time you make a new transaction/purchase. • Purchases made via the Amazon App are ineligible for Cashback. • Purchases paid partially or in full with gift cards or Amazon credit are ineligible for Cashback. • Gift Cards, Vouchers, Charity, Non-Profit items, and Amazon Prime memberships are ineligible for Cashback. 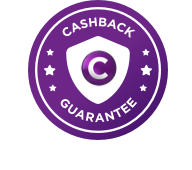 • Use of coupon codes not listed on Cashrewards may invalidate Cashback. • Multiple items purchased in a single transaction will report into your Cashrewards account on a per item basis on their individual shipping dates. • Orders will be tracked & processed automatically into your Cashrewards account as pending within 7 days of purchase. • Cashback is paid on eligible purchases, excluding shipping/delivery, taxes and GST. • Pre-orders are eligible for Cashback only if the item is scheduled to be shipped within 60 days of purchase. • For the purposes of Cashback, Smartwatches are classified as Electronics. If your transaction does not appear as pending in your account within 4 days from purchase date, please contact us within 45 days to claim your Cashback. The return period of the goods has passed and the store has confirmed your cashback. Your rewards are now available for payment. Shop millions of items via Amazon AU on Amazon's Global Store.